Our vision is for Meadlands to be a reading school; where children pick up a book for pleasure, where children enjoy discussing books and books are seen as the gateways to adventures. 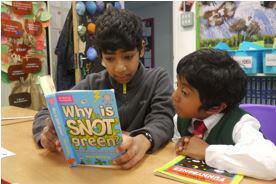 Ready Steady Read is a half termly reading competition that the whole school takes part in. Each class has a book or a group of poems to read but there is no restriction to read the book assigned to your class. In this way, children can be challenged or supported but still engage in reading. When a child has read the book, they are “tested” on it by an adult in the school and then their name gets put forward to a half termly raffle. If they read the six books in a year, then their name is entered into the annual draw. Prizes have included book vouchers from “The Alligator’s Bookshop” in Richmond, tickets to the Roald Dahl Museum and a Kindle. Year 5: Once by Morris Gleitzmann. This is an age appropriate book but covers a challenging theme so please read this along with your child. Year 2: The Giving Tree by Shel Silverstein. This is a book best read, shared and enjoyed together.